This is the second article in the “Spend Less Money” series. To read part one, click here. If you asked a professional sound engineer or studio manager what the number one way to save money in the studio is, they will probably tell you to come prepared. When time is wasted, the dollars begin to add up quickly. So how do you prepare well? We will be addressing this issue in our next few blogs, and today we start out with something you might have overlooked as you began studio prep. I know you’ve heard it before. Demos—from a simple recording on your smartphone, to a fully produced track—are an important step in the songwriting process. If you are hoping to pitch your song to another artist, a professional demo could help you get those placements. But the demos we are talking about function a little differently. These are your pre-production demos. They are for you (and your band) to get to know your music better before you hit the studio. They are for tweaking the songs until you get them just right, and they give studio musicians or your band something to rehearse to. If done well, they can even function as a scratch track in the studio, saving you time and money as you begin the tracking process. In many situations, a simple recording on a smartphone will suffice for a demo. But to use pre-production demos to their full potential, you are going to have to go one step further. Your demos don’t have to be so fantastic that you don’t actually need to go into the studio after they’re finished. But there are a few key elements that you will need to be able to control as you create your pre-production demos. You will need a Digital Audio Workstation that will allow you to have control over tempo, and allow you to use a MIDI keyboard or controller. There are many different kinds of DAWs at all different price points. You just need to find one that you are comfortable using. If you already have a more advanced DAW like Protools, use that. Audacity is a free DAW, and Garageband comes pre-loaded on most Macs. If you are able, I also recommend purchasing a simple USB interface, like this one. This will allow you to hook up a MIDI Keyboard, as well as plug in your guitar and favorite microphone. However, you don’t have to. Most Macs and PCs have built in audio recording devices, and Garageband will allow you to input MIDI using your computer’s keyboard. Although it may be easier in the long run to purchase a USB interface, you can still create a useful pre-production demo for free. The exact tempo of the music can drastically alter the feel of a song. Even just a few beats per minute (BPM) up or down can have a huge impact. Before you record your demo, rehearse the songs with a click track. If you’ve never used a click track before, this can be a big adjustment. However, playing to a click track is vital for studio work. The better you are at staying locked into the click, the smoother your recording process will be. As you are rehearsing, try changing the BPM of the click, and playing the song at new tempos. You may find your song works really well as a ballad instead of the mid-tempo rock song you thought it was. When you find a tempo you think works, create a click track in your DAW and record a simple track, guitar or keyboard and probably vocals. Have other people listen to the song. Have your guitar player or drummer play along with it. If they think it’s too fast or too slow, play around with it. If you record MIDI (Musical Instrument Digital Interface) keys as your basic track, it will be easy to adjust them to a new tempo without re-recording. 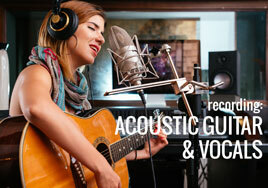 If you recorded acoustic guitar, you may need to re-record. That’s okay. Better to spend a little time up front on these demos than to discover halfway through tracking in an expensive studio that the song is too slow. As you are playing through a song, you may discover that the key you wrote the song in is not the best key to record the song in. The ability and range of the primary vocalist is the biggest determining factor when choosing a key. You need to make sure your vocalist is comfortable, and can achieve the sound you want in the key the song is written in. It’s also important to remember that different instruments work best in certain keys. If you know you want to feature brass heavily on a song, it’s best not to record that song in a key with 7 sharps. Brass players usually feel more comfortable in flatted keys, string players feel better in sharped keys. Keeping your instrumentation in mind while you’re choosing a key can help you get a great finished song. Pre-production demos are also a great place to work out auxiliary parts for your songs. Once you determine the tempo and key, you can use your MIDI keyboard to do some experimentation. If you think that a song needs strings, try adding a string part with a virtual instrument. Doing some of your production this way will allow you to communicate better with session players, a producer, or a sound engineer. This is also a good time to get your lead guitarist to nail down his solo. While you should allow for creativity to happen when you’re actually tracking, having a plan and knowing exactly what parts you want for each song will make your life easier when it comes time to actually record. The biggest reason that pre-production demos are important is their role in saving you time and money as you prepare to lay down tracks. This is true whether you use a home studio, or a professional studio. Pre-production demos allow you to tweak your songs easily, let you play around with sounds, tempos, and meters, and let you know exactly how the songs is going to be structured. That way when it’s time to record, you have a clear picture of what you want. This can be especially helpful if you are in a band and want multiple band members to have input on the overall direction of a song, but don’t want to spend time discussing it in the studio. Regardless of where you are recording, saving time means saving money and pre-production demos allow you to be prepared. In addition to allowing you to experiment with your songs, pre-production demos can help with the song selection process, and deciding the order of songs in your project. Although you might already have a good idea of what you want, these demos can help you iron out the rough patches. Listening to the pre-production demos—and allowing other people to hear them—can give you a good idea of what songs are actually good enough to make it on the album. After you have a good idea of what your best songs are, you can begin to listen to them in the order you think they belong in. This allows you to listen for any odd transitions between songs. Pay special attention to what keys your songs are in at this phase. Transitions between keys can greatly affect the mood of your album. You should also listen to how tempos are grouped. If too many slow songs are together, the album may drag. If too many high energy songs are paired with each other, the audience may get bored. A good way to combat this problem is to have a non-musical friend give you their opinion. Though they might not know exactly what is going on musically, they will be able to listen objectively and point out some issues you may have missed. Listening through your pre-production demos can help you solve these potential problems before you ever get into the studio. The great thing about pre-production demos is that they are unfinished. Their point is to be a continual work in progress. Let yourself have the freedom to experiment and tweak them. If you use your demos well, you can have better communication between band members, producers, engineers, and session players. They can also help you to achieve a better finished product for less money. Have any questions or tips on creating demos? Any advice on saving money when you record an album? Let us know in the comments below! Condenser microphones are the most common types of microphones you’ll find in recording studios. They have a much greater frequency response and transient response (which is the ability to reproduce the “speed” of an instrument or voice). They also generally have a louder output but are much more sensitive to loud sounds. PROs: Much greater frequency and transient response. A louder output. CONs: Often more expensive than dynamic mics. They can be very brittle with little low end. They require phantom power (48v). They are very sensitive to loud sounds and may require a pop filter for plosives ‘p’ sounds. Large Diaphragm Microphones – Large diaphragm microphones (LDMs) are generally the choice for studio vocals and any instrument recording where a “deep” sound is desired. A large diaphragm microphone generally warms up the sound of what it’s recording. If using a condenser microphone for vocals, you’ll likely want to use a pop screen; these mics are so sensitive to transient noises that the “P” and “SH” sounds you make will cause distortion. 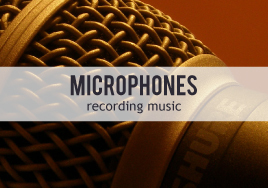 Small Diaphragm Microphones – Small diaphragm microphones (SDMs) are generally the best choice where you want a solid, wide frequency response and the best transient response, which, as we mentioned before, is the ability for your microphone to reproduce fast sounds (such as stringed instruments). Once you have decided on the type of mic you are going to use, let’s go over mic positioning. Try to position the mic far enough away to capture the voice and guitar, but not so far that you capture the room sound. This is going to take some testing of various mic positions for the sound you want. Again, use your ears for best judgment. As important as proper placement is, it’s even more important to use a mic with the right pattern. A cardiod mic in this scenario may work well because they reject sound from the rear. On the other hand, omni mics have a figure 8 pattern, which means they pick up sound from the front and rear of the capsule. If you’re using a large‑diaphragm condenser, you can achieve a useful improvement in the amount of separation by switching from cardioid pattern (where the null is behind the mic) to figure‑8 (where the null is perpendicular to the plane of the mic, and much deeper than in cardioid). How does this help? Using a figure 8 pattern or omni mic means that the null point will cancel the other mic out of its pickup. You may still have some spill, but you won’t have as much of a phasing nightmare. A small diaphragm cardioid condenser is preferable here. As a starting point, aim it down so it’s looking at the 12th fret, and set it about 6-8 inches away. Large diaphragm condensers can also work nicely on acoustic guitars, as well as ribbon mics. Have fun experimenting with different mics and placements to find what works best for you. When it comes time to overdub vocals, you’ll want a large diaphragm condenser mic. For a lead vocal, you should match the mic to the vocalist, who may have a personal mic preference. As you can see, there are different techniques for different mics for different applications. There really is no standard setup. As I always tell musicians and engineers, use your ears to find out which mic and setup produces the sound you want. 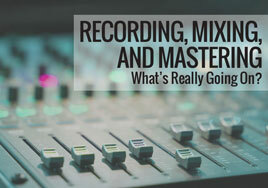 Recording, Mixing, and Mastering—What’s Really Going On? As an audio engineer, I constantly meet people, including clients, who have no idea what the differences are between recording, mixing, and mastering. They might have heard the terms before, but they usually can’t correctly describe what each term means. 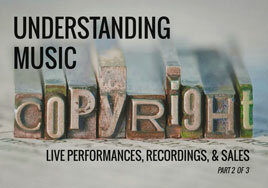 For those not in the music industry, that’s both understandable and acceptable. However, for those of you in the music business, whether you’re an artist or a manager or an engineer, you need to know what those terms mean. First, here are some basic definitions for you: recording is the process of capturing sounds, and a recording session is one instance where this happens (as opposed to a live performance). A standard recording session involves multiple musicians, instruments, and vocalists. So, for the sake of this illustration, we’ll say your band has a drummer, guitarist, bass player, keyboard player, and two vocalists. Now, you could record everything on one microphone… but the drums might overpower the vocals, and the keys might blend into the bass line in certain sections. Recording everything together is like playing entirely unplugged; it can work, but most bands perform miked and plugged into sound systems to provide their audience with a good and balanced audio experience. That same option exists with recording. Instead of recording everything through one microphone, you can record each element separately to its own track in the workstation or mixer. This approach, which is called tracking, lets you (or, more likely, your audio engineer) go in later to perfect the balance of sounds. Note that I said each element, not each instrument or vocal. That’s because some instruments consist of multiple elements, each of which will need its own mic. For example, a standard drum kit might have a mic for the kick, snare, floor toms, rack toms, cymbals, and high hats. This allows you to create a much more precise sound in the next phase: mixing. Mixing is taking the individual elements that were recorded as separate tracks in the workstation or on tape and adjusting their levels and tones to create the right balance. Remember when I mentioned that, without separate mics (and their resulting tracks), the drums might overpower the vocals? That’s a balance issue, and mixing allows you to prevent or correct that. With mixing, you can ensure that certain tracks aren’t overbearing or piercing or, at the other end of the spectrum, too soft and buried by the other elements. You also apply EQ, compression, editing, and effects if they are needed or desired. Once the mixing is complete for a track, the engineer saves a “mixdown” of the song, which is turned into an album in the next stage: mastering. Mastering is an important part of the process that many artists overlook or undervalue. It’s more than just cranking up the volume, which is what many artists request. It requires a big picture approach and an eye for detail. Without both efforts, the finished album isn’t… well, it isn’t finished. With today’s technology, it is becoming increasingly easy to record and mix in your bedroom or home studio. While this can be a viable option (which I will elaborate on in a future article), I honestly recommend hiring a professional audio engineer for your recording project. In addition to having the gear and software, a good engineer and studio will have proper room acoustics, training, experience, and an ear for what they do. Those valuable tools aren’t acquired easily, nor are they sold on store shelves. If you’re heading into your first recording session, you might not know what to expect. 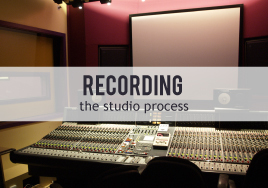 To help, we’ve assembled a basic outline of the recording process below. Please note: each recording session is unique, and preferences will vary from one band or recording studio to the next. Some artists do as many takes as necessary to obtain the elusive perfect version, then carefully blend the tracks together. Other artists use software as their recording studios and do only one sitting, adjusting it digitally as needed. Other artists prefer to record live performances, including variations, flaws, and audience interaction. For the sake of simplicity, we’ve looked at the basic process using organic instruments. This is the skeletal framework of the song. Start with the drums, then the bass, then record the rest of the instruments. Remember: not everyone nails it their first time out of the gate. In fact, the unpredictability of artists is one of the things that makes recording so exciting. Tip: you may want to use a metronomic click track to help your rhythm section keep time. Once the backing tracks are set, you will likely record a reference or “scratch” lead vocal to serve as a guide for backup singers. This also provides a preview of the finished product—which is often encouraging and inspiring. How do you want the background vocals to sound? Like the Beach Boys? Like ELO? Or do you want something a bit simpler? While your music should be ready before you enter the studio, this is when you officially decide what path the song will take. Consider this the “season to taste” portion of the recipe. Does the song need a little guitar solo here or some extra oomph there? Listen to what you have so far. What is it calling out for? Time to give the performance of your life. You might get it in one take, or you may nail it on the thirtieth. Give it your all, and be patient. If you thought you were done when the recording wrapped, think again. Mixing is the art of squeezing a studio full of music into a space the size of a human ear. Scrutinizing every square inch of the track and making sure every level and sound is perfect takes time. Put the coffee on and get cracking. It’s that simple. Now, all you have to do is repeat the above ten or twelve times, and you’ve got yourself an album. Have you been through the recording process? Did it flow like we described, or was it different for you? Do you have any advice for first-time recorders? Headphones may be overlooked when people think about what equipment is needed to make music recordings happen, but they are an important part of the recording studio. In a recording session, artists may want to use headphones to hear their voice or other parts of the arrangement. The headphone mix may affect their performance, so it’s important that you have good headphones to help the artist hear clearly and perform their best. 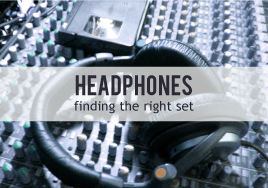 When choosing a pair of headphones for music recording, keep in mind your needs. Will you be mixing with them? Make sure they are comfortable and honest sounding. Will you be using them for artists to be monitoring while recording? Choose a pair that are closed and isolating. Before listening and trying them out, make a mix of music you are very familiar with. Listen to what the high end, low end, and mids sound like. Make sure the headphones replicate each well. Have you established a recording studio? What type of headphones do you prefer to use, and why? See also: Recording Music: Pros and Cons of Creating a Home Studio, Recording Music: Essential Equipment for a Home Studio, Music Recording Equipment: The Best Microphones, Music Recording Equipment: Digital Audio Workstations. In both live performances and music recording, there are a lot of components that affect the way the final product will sound. Because they are the initial pieces to capture and filter the sound of instruments or voices, microphones are very important. Capturing the sound during music recording sessions as best as possible is an important part of the recording process. Although they aren’t the only element that matters, the right tools make a big difference. Do you have a favorite mic for recording? Is it one of the above mics, or something else? Does your go-to mic vary depending on what you’re recording? See also: Recording Music: Pros and Cons of Creating a Home Studio, Recording Music: Essential Equipment for a Home Studio, Music Recording Equipment: Digital Audio Workstations, Music Recording Equipment: Finding the Right Headphones. Before the rise of computers, recording studios had tape machines that they recorded to, and editing was done by cutting and pasting pieces of the recording with a razor and tape. Today, Digital Audio Workstations (DAWs) have taken the place of those tape machines, bringing with them a multitude of options that didn’t exist previously. 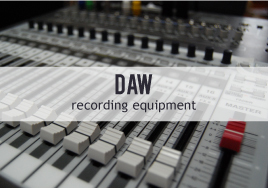 If you are setting up a recording studio, DAWs are a necessity, especially you plan to collaborate with other industry professionals. There are many different DAWs to choose from, so we’ve pulled together some of the best and most popular. Take a look through these options and see what is best for you. Pro Tools is arguably the most popular (or perhaps a more appropriate word is common) DAW. Pro Tools Express comes with an interface and a basic set of plug-ins for $499. Compare the different versions on this comparison chart. A free trial of Pro Tools 11 is available. Available for both Mac and Windows OS. The latest version of Logic Pro X comes with awesome new features which previously required third-party plug-ins (Drummer, a drum programmer; Arpeggiator; and Flex Pitch, a tuning application). The now-included plug-ins are a step forward, making this program excellent for programming and making synths and beats. The dark interface also allows for less strain on your screen and battery. $199 on the App Store; Mac OS only. Like other DAWs, Cubase offers versions of the program at varying price points and with various features, allowing you to choose the level that fits your budget and your needs. This program has many plug-ins, including pitch correction (standard in all versions). Prices range from US $99 to EUR $699; available for both Mac and Windows OS. This program is made by Presonus and also has varying programs (Free, Artist, Producer, and Professional) at varying prices. Compare their different features and prices, and find the version best suited to your needs and budget. Available for both Mac and Windows OS. Reaper is a one-version program with much of the same functionality and ability as the other DAWs listed. It offers a 60-day free trial, after which the license is only $60. Available for both Mac and Windows OS. While it may be obvious that you need this equipment, the choice may not be as clear. Our best advice is to identify your studio’s needs first, then research and compare your options. Have you purchased one of the above DAWs? Or is there another version that you use? How has it worked out for your studio? See also: Recording Music: Essential Equipment for a Home Studio, Recording Music: Pros and Cons of Creating a Home Studio, Music Recording Equipment: The Best Microphones, Music Recording Equipment: Finding the Right Headphones. 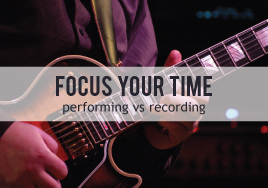 Should you start recording or keep performing? This is an inevitable dilemma for any musician who wants to promote their music, but it shouldn’t be a hard one to figure out. Why do you want to record your music? Are you sending press kits to venues, trying to book shows? 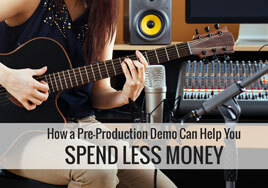 Are you sending demos to record companies? Have your fans been begging for recordings of their favorite songs after you rock a show? If you answered yes to any or all of the above, it might be time to think about recording. Did you come up with your band name last week and finally finish writing your second song today? Don’t even think about recording—yet. It’s just not time. Your sound will inevitably change and, hopefully, improve as you continue honing your craft. Focus on developing and polishing your sound. Keep rehearsing, and take every opportunity to play in front of real people. 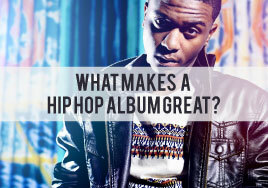 Build your music portfolio and your fan base. When you have a cohesive, well-rehearsed set that you have played for cheering crowds, you can consider recording. Can you make the time for recording? Recording a song well (by yourself or in a professional studio) can take days to weeks depending on the circumstances. It’s a serious time commitment and requires patience and skill to produce something desirable. Can you take time off from work, rehearsal, gigs, and your personal life to get this done? Whether you visit a studio or record your own music, recording can be a frustrating and creativity-killing process, especially if you’re inexperienced. Using a professional studio can reduce some of the stress, but it can also be a pricey investment. Are you willing to take on this task? If not, have you found a studio you can work with? While it is important to give fans access to recorded music, do not record your songs on a whim under less-than-ideal circumstances just so you have something to put on your website, MySpace, or BandCamp page. Remember, a sloppy recording can hurt you just as much as a well-recorded demo can help you. If you can’t do it right, it’s probably better to wait until you can. If, after considering these points, you’re ready to record, congratulations and good luck! If you need more time, don’t be discouraged; you’ll get there soon enough. Have you made the transition from performing to recording? How did you know the timing was right? What advice do you have for artists considering recording their first album?